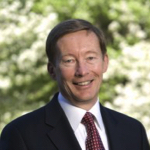 Charles J. Dunlap Jr. joined the Duke Law faculty in July 2010 where he is a professor of the practice of law and Executive Director of Duke University School of Law’s Center on Law, Ethics and National Security. His teaching and scholarly writing focus on national security, law of armed conflict, the use of force under international law, civil-military relations, cyberwar, airpower, military justice, and ethical issues related to the practice of national security law. Dunlap retired from the Air Force in June 2010, having attained the rank of major general during a 34-year career in the Judge Advocate General Corps. In his capacity as deputy judge advocate general from May 2006 to March 2010, he assisted the judge advocate general in the professional supervision of more than 2,200 judge advocates, 350 civilian lawyers, 1,400 enlisted paralegals, and 500 civilians around the world. In addition to overseeing an array of military justice, operational, international, and civil law functions, he provided legal advice to commanders and civilian leaders at all levels. Dunlap previously served as the senior lawyer (staff judge advocate) at Headquarters Air Combat Command at Langley Air Force Base in Virginia and at Headquarters Air Education and Training Command at Randolph Air Force Base in Texas, among other leadership posts. His other assignments include the faculty of the Air Force Judge Advocate General School where he taught various civil and criminal law topics. An experienced trial lawyer, he also spent two years as a military trial judge for a 22-state circuit. He served tours in the United Kingdom and Korea, and he deployed for operations in the Middle East and Africa, including short stints in support of the wars in Afghanistan and Iraq. He also led military-to-military delegations to Colombia, Uruguay, Iraq, and the Czech Republic. A prolific author and accomplished public speaker, Dunlap’s commentary on a wide variety of national security topics has been published in leading newspapers and military journals. His 2001 essay written for Harvard University’s Carr Center on “lawfare,” a concept he defines as “the use or misuse of law as a substitute for traditional military means to accomplish an operational objective,” has been highly influential among military scholars and in the broader legal academy. Dunlap’s legal scholarship also has been published in the Stanford Law Review, the Yale Journal of International Affairs, the Harvard Law’s National Security Journal, the Wake Forest Law Review, the Fletcher Forum of World Affairs, the University of Nebraska Law Review, the Texas Tech Law Review, and the Tennessee Law Review, among others. He is the author of “The Origins of the Military Coup of 2012”, originally published in 1992, which was selected for the 40th Anniversary Edition of Parameters (Winter 2010-2011). He is also the author of “Airpower” in Understanding Counterinsurgency (Thomas Rid and Thomas Keaney, eds., Routledge, 2010), and his essay on “The Military Industrial Complex” appeared in the Summer 2011 issue of Daedalus. Most recently, his essay, “Lawfare 101: A Primer,” appeared in the May-June 2017 issue of Military Review. His article on international humanitarian law was published in 2012 in the German Red Cross in their Journal of International Law of Peace and Armed Conflict. His chapter on military law appeared in The Modern American Military (David Kennedy, ed., Oxford University Press, 2013), and his op-ed, “Bringing Bergdahl Home Was the Right Choice—Deserter or Not,” was published by Time Magazine (online) in March of 2015. Additionally, his recent commentaries include “Trump’s Cabinet of ex-generals will help keep him out of wars, not push him into one, which appeared in VOX in December of 2016, and “Why a Russia probe may make the left squirm, too, not just the right”: which appeared in The Hill in March of 2017. Dunlap has written a number of articles on cyberwar including “Perspectives for Cyber Strategists on Law for Cyberwar” which appeared in the Spring 2011 issue of Strategic Studies Quarterly and his piece, “The Hyper-Personalization of War: Cyber, Big Data, and the Changing Face of Conflict,” appeared in the fall 2014 issue of the Georgetown Journal of International Affairs. His article, “Ethical Issues of the Practice of National Security Law,” was published by the Ohio Northern University Law Review in 2012, and re-published by the American Bar Association’s Standing Committee on Law & National Security for their annual conference in 2013. His chapter, “Clever or Clueless? Observations About Bombing Norm Debates,” appeared in The American Way of Bombing: Changing Ethical and Legal Norms, from Flying Fortresses to Drones (Matthew A. Evangelista and Henry Shue, eds., 2014). Dunlap’s wife, Joy, was formerly a vice president of the National Association of Broadcasters, and later the deputy director of Government Relations for the Military Officers Association of America. In 2016 she completed her term as the president of the Duke Campus Club, and in 2017 she was awarded the Order of the Emerald by Kappa Delta sorority. They reside in Durham. Professor Dunlap’s blog is Lawfire.